Proper dental care can detect dental disease that not only affects the mouth, but can also lead to more serious health problems such as heart and kidney disease. Good dental hygiene is just as important for pets as it is for humans. Yet, it is one of the most overlooked areas in pet health. 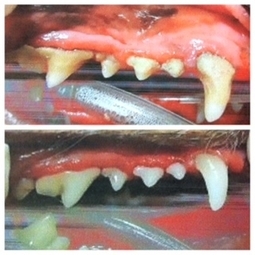 We believe in the importance of routine dental care for your pet. We start with digital dental x-rays to give us a deeper look under the gumline. We then use an ultrasonic scaler to clean each tooth thoroughly - above and below the gum line followed by polish to create a smooth tooth surface more resistant to plaque buildup. If necessary, we provide surgical tooth extractions for broken or painful teeth. More complex dental procedures such as root canals are available by referral.